As Limerick’s Tim Rice (71) missed out by three strokes, former Skerries player Hopkins closed with a five under par 67 to finish sixth at Bloemfontein Golf Club and give himself the chance of playing some tour events on the Sunshine Tour in the new year. “Great end to a long year of hard work, full sunshine tour card and a great day in the office today 67 bogie free that’s how we roll Wayne Westner can't thank this man enough slogged my bag around for 126 holes (7 rounds) in 40 degrees heat 👌it's all ahead of us now !!" Rice ended the week in 47th place on three under after closing 71 as South Africa’s Christiaan Bezuidenhout, who tied for eighth in the Irish Amateur Open at Royal Dublin last year, holed a 15 footer for eagle at the 18th to take the top card. Bezuidenhout posted a fifth round 66 that gave him victory by one stroke on 20 under par from England’s Jack Harrison (68). South Africa’s Andre de Dekker was three shots back in third, Botswana’s Stuart Smith was fourth and Zimbabwean Greg Bentley finished fifth. 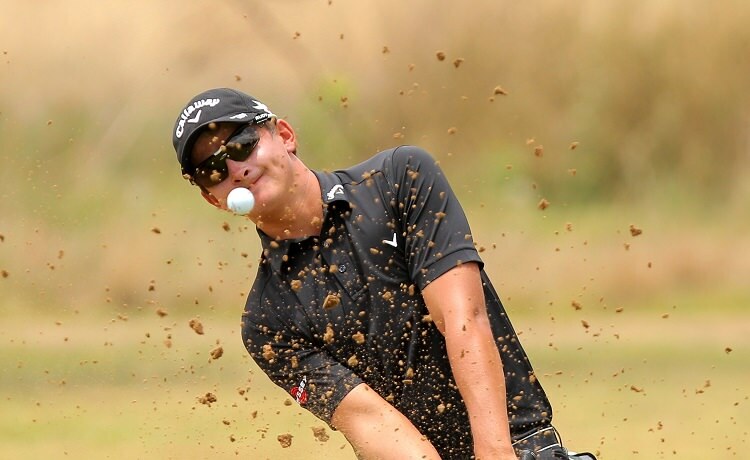 There were five amateur who inside the top 30 and ties who earned their cards – Hopkins and South Africans Ruan Pretorius, Jason Viljoen, Teaghan Gauche and Neal Herman. Hopkins had a promising schoolboy football career with St Kevin’s Boys and while Liverpool, Blackburn Rovers and West Brom took an interest, his footballing ambitions were scotched by Osgood-Schlatter disease. He turned to golf at 15 at Skerries and got his handicap down from 24 to scratch within two years, going on to reach the semi-finals of the British Boys in 2010. He was tied second in the Lytham Trophy in 2011 but went through a barren period before bouncing back to top form this year with a run to the quarter-finals in the South of Ireland Championship. The 23-year old played a major role in Leinster’s Interprovincial Matches victory at Rosapenna and in partnership with Shaun Carter, he went on to help Royal Dublin win the AIG Barton Shield for the first time in 47 years and was recently recalled to the Irish senior panel.